I love those belgian waffles you get at the free hotel breakfasts. I finally bought the belgian waffle iron, but my waffle recipe was seriously lacking. I’ve tried so many and just had not yet hit upon one I loved. In addition to that, I really prefer to use white wheat flour to bump up the nutritional value, but it usually makes baked goods taste more dense. 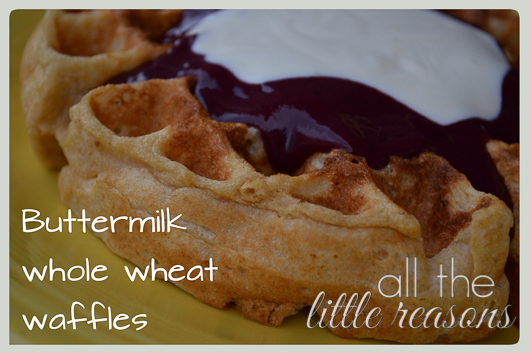 For a “once in a while treat” like waffles, I will just use plain old white flour. But I really wanted to move toward fully embracing wheat all the time. I had buttermilk in my fridge and just like my whole wheat pancake recipe, store bought buttermilk makes everything yummier and fluffier, even when using wheat flour. So my Pinterest search began. I hit upon this recipe and I’m hooked! It was light, it was fluffy, and even with my addition of wheat flour, it was not dense, it was not wheaty (thanks to the white wheat and buttermilk). It’s my new favorite! Here’s my adapted recipe.